The Best Cheesecake in New York State is in Albany! Cheesecake is one of the most popular dessert items, and for good reason. While many love cake in general, cheesecake in particular embodies a really rich, fluffy texture that other cakes just can't compare to. And, it's super versatile, with seemingly infinite possibilites for variations and flavors. If you're looking for amazing cheesecake in the Albany area, you're in luck! The best cheesecake in Albany also happens to be the best cheesecake in all of New York State! In 2017, Delish compiled Yelp data to determine the best cheesecake in the entire state is Cheesecake Machismo of Albany. 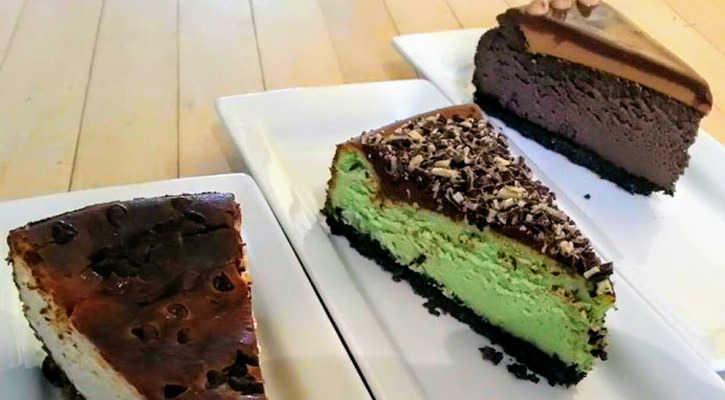 Cheesecake Machismo's cheesecakes are not only the best of the best in terms of quality, as they are made fresh daily, but you also won't find a wider variety of flavors anywhere else - more than 500 flavors reside in the Cheesecake Machismo recipe box. Different flavors are selected each day, and they're always fun and original, like Butter Rum Apple, Caramel Toffee, or Blueberry Maple. Perhaps the best way to try out different flavors is to opt for a "frankencake." You can select any combination of flavors that are in stock to make up one cake of 12 slices. Frankencakes cannot be preordered; they're only first come, first serve. In fact, if you do want to order the general cheesecake ahead of time, you'll need to do so a week in advance. And, they often sell out before closing time. That's how good they are! The next time you're craving a rich, creamy dessert, or need something special for an event or get-together, stop by Cheesecake Machismo. But, you might want to call head to see if they've sold out for the day!